Here’s another old, old recipe from the South Shore of Nova Scotia. 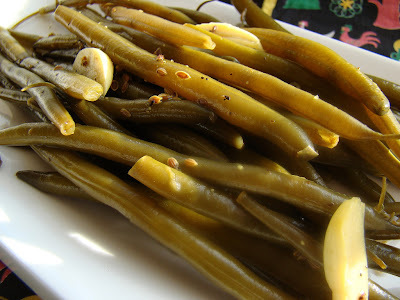 There’s a common variety of pickled beans that, if you are Canadian, you are probably familiar with. It has become trendy recently to substitute the celery stalk in a Ceasar cocktail for a pickled bean. You can purchase them by the jar in the Mexican section of the grocery. They are spicy, garlicky, vinegary and quite tasty. If you’re not from Canada, the Ceasar is a cocktail that was invented in 1969 by Walter Chell, a bartender at the Owl’s Nest Bar in Calgary. 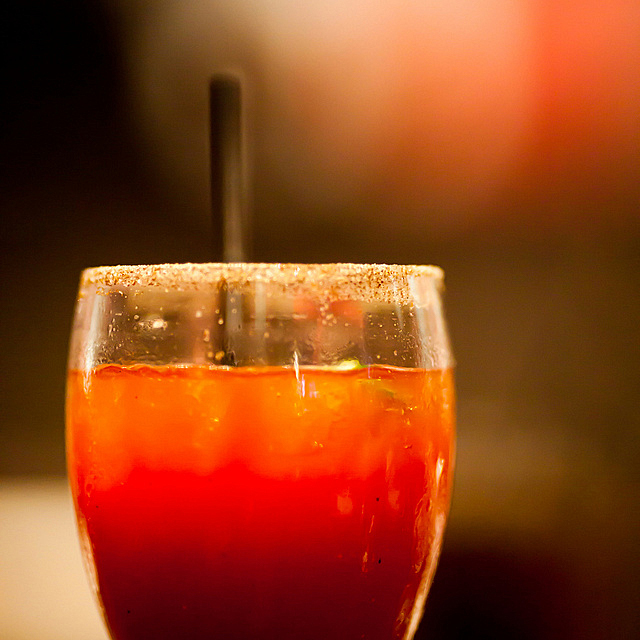 A typical Caesar contains vodka, Clamato (a proprietary blend of tomato juice and clam broth), Worcestershire and Tabasco sauce. It is served with ice in a celery salt and pepper rimmed glass, with a wedge of lime. They’re quite good, especially with brunch. You should try one. The taste is difficult to describe. If you like them, you love them. They’re very difficult to find now in any stores. Only a few places I know of still offer them for sale, and they’re all on the South Shore of Nova Scotia. It probably has something to do with the German influence in that area of the province. We always used to have a few jars in the basement for use during the winter. It’s actually quite easy to turn this recipe into the spicy variety if you wish. They’re the twin sister of the old time recipe, with "additions." As opposed to a dinner vegetable, they are consumed as a salty snack, or in a Caesar or Bloody Mary. The ingredients listed as optional in the recipe will do the trick for you. It is important to get the best looking beans you can find. Ugly raw beans will make ugly pickled beans. Usually fresh imported beans show up in our local grocery stores from the USA in Spring. You can also wait for our local beans to come into season, but that is much later (but cheaper). Ensure that your jars and canning pot are well washed. 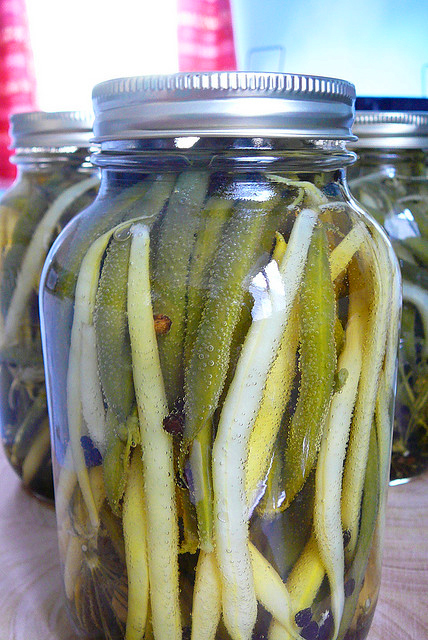 The jars themselves should be sterilized. To do so, place the jars, rings and lids in the canning pot with enough water to cover and boil for a few minutes. Remove with tongs and place on a clean surface. Wash the beans well and allow to dry. Snap or cut the stem ends off the beans and pack into the jars. You can put beans in whole or cut in two. I prefer the long beans for presentation value. Just make sure you have 1/2 inch of head room in your jars. If not, trim the beans. If using the optional ingredients for spicy beans, place them in the jars with the beans. Heat the salt, vinegar and water just to boiling. Take the hot sauce and pour into the jars. Ensure to leave some space between the liquid level and the top of the jar (between 1/2 and 1/4 inch) — enough to cover the beans. Put the sterile lids and rings on the jars and tighten “finger tight”. This means enough to ensure there is no leakage, but don’t force the rings on too tight. Stand the jars of beans upright in the pot. Ensure that the water level is up over the jar tops. It’s best to put a rack or some kind of elevation between the jars and the pot bottom. It’s not entirely necessary and I have processed beans without a rack many times. Bring to a boil and process for the recommended time for your altitude. Remove from the hot water bath and allow to cool on the counter overnight. You will hear the characteristic “pop” of the lids as they vacuum closed as they cool. Once cooled, you can tighten the rings again to ensure a tight fit. Let sit for 14 days before using. Store in a cool, dry place.